Coffee in Vietnam is also focused around growing Robusta and Arabica, two of the major kinds of coffee favored in the world market. 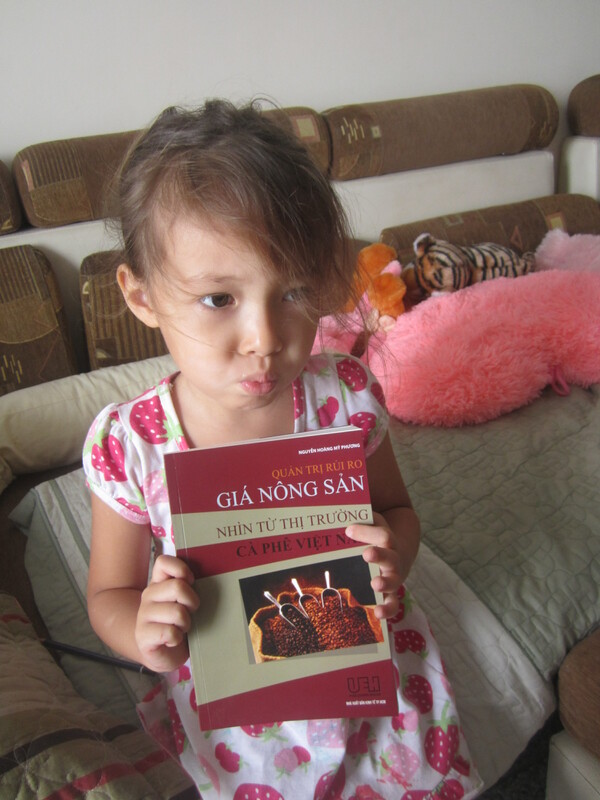 Quản trị rủi ro giá nông sản – nhìn từ thị trường cà phê Việt Nam (2013) by Nguyen Hoang My Phuong is an excellent analysis into Vietnam’s coffee market. Dr. 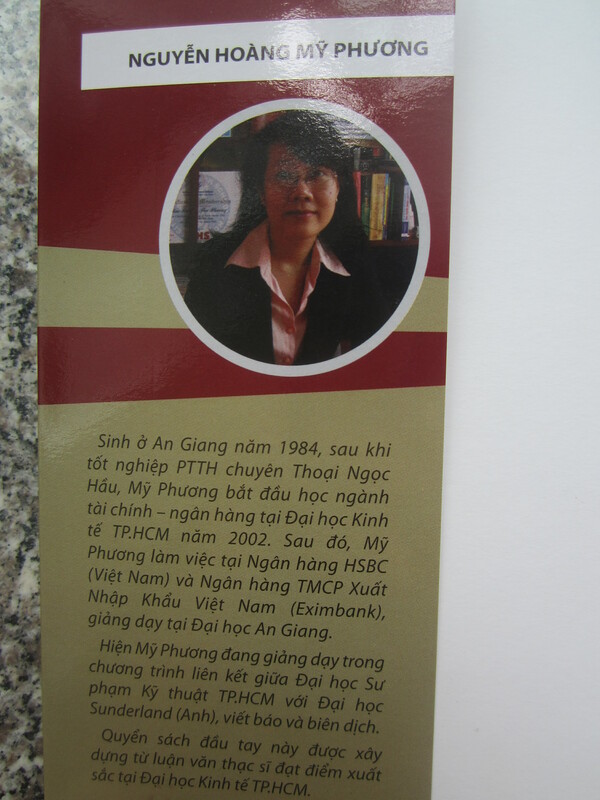 Le Thanh Hai, from the Polish Academy of Sciences, calls My Phuong’s book ”the most carefully researched master thesis” he has ever read in Vietnam. 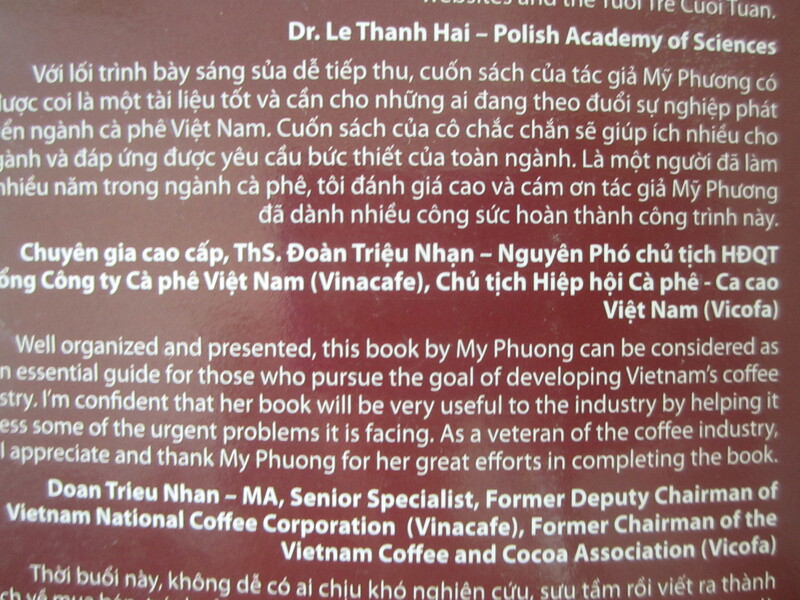 Likewise, Doan Trieu Nhan, a senior specialist and former Deputy Chairman of Vietnam National Coffee Corporation (Vinacafe), states that the book is ”well organized and presented” and that My Phuong’s book ”can be considered as an essential guide for those who pursue the goal of developing Vietnam’s coffee industry.” I happen to agree with these comments and found the book to be enlightening and honest, a rare thing from most writers in Vietnam. So, why is this book so special? For one reason, coffee happens to be a major industry and pastime here in Vietnam, and I consider Vietnamese coffee to be the best in the world; I’m not saying that because I live in Ho Chi Minh City either, but because I have lived and traveled to over ten countries and have tasted a variety of coffee only to conclude that Vietnamese coffee is the best. And I am not the only one who thinks so. In 2012, Vietnam surpassed Brazil to ”become the largest coffee exporter in the world” (p 195). Brazil might currently be the largest, but Vietnam still is in a very close second and will be so for the next few decades. Coffee in Vietnam is also focused around growing Robusta and Arabica, two of the major kinds of coffee favored in the world market. So what is the problem with Vietnam’s coffee exporting market? 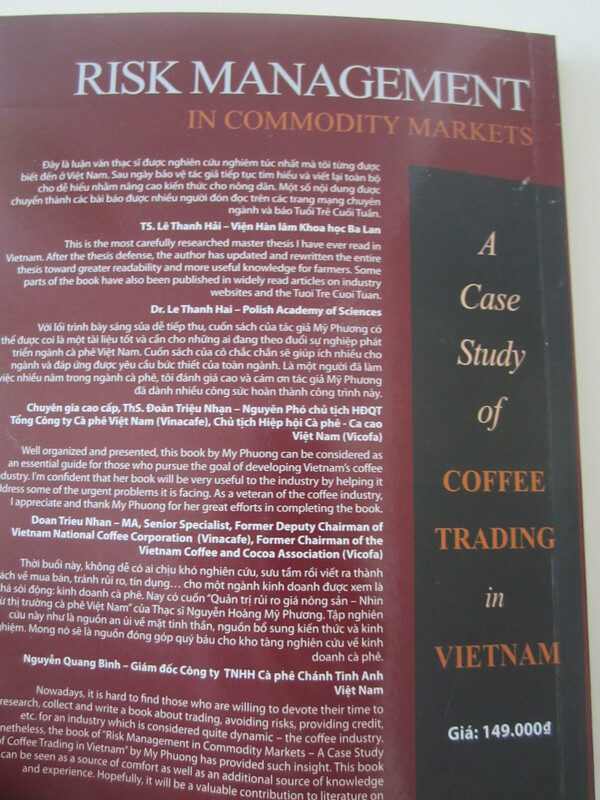 The two major issues I gained from reading My Phuong’s book are (1) trust and (2) a need for a clear understanding among Vietnamese traders regarding international practices for buying and selling coffee. First, trust is a rare notion in Vietnam. A better motto in Vietnam would be: ”show me the proof”, which only creates frustration among locals and expatriates and adds to unnecessary delays through unnecessary bureaucratic devices. Most often, personally, I have found government officials and business (such as banks) simply reciting repeated cultural practices, which are not the law in any shape or form, rather than performing actual laws established by the official government. When I ask officials to show me the official law, officials often simply say, ”Go away.” Therefore, in my experiences, officials both in the government and private sectors show a lack of mastery in their practices which create a lack of trust among native Vietnamese and foreigners. 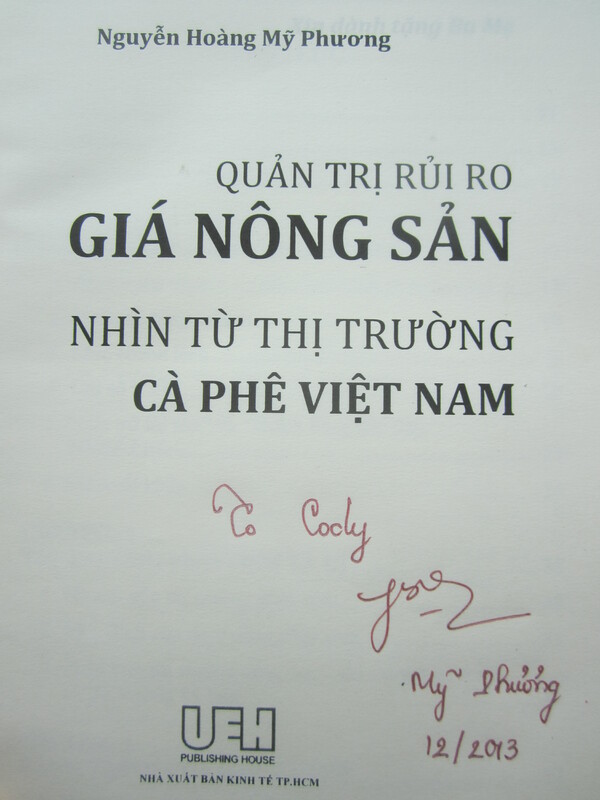 This corresponds to what My Phuong describes in her book: a need for social trust among coffee growers, traders, buyers, sellers, the local Vietnamese government, and international markets wishing to do business in Vietnam and abroad. ”Now back to the root of the current common word ‘credit,”’ writes My Phuong on page 200, ”Coming from the Latin ‘credo’ which means ‘I believe’, ‘credit’ is fundamentally an issue of trust. Without trust (‘social capital’), we do not have credit. Without ‘credit’, the financial institutions, the network of coffee agents in the Central Highlands of Vietnam may not be willing to lend their funds” (p 200-201). And why would anyone lend money or do business without trust? I find many businesses in Vietnam are starting to learn that the concept of trust is vital not only to their short-term success but to also their long-term stability. 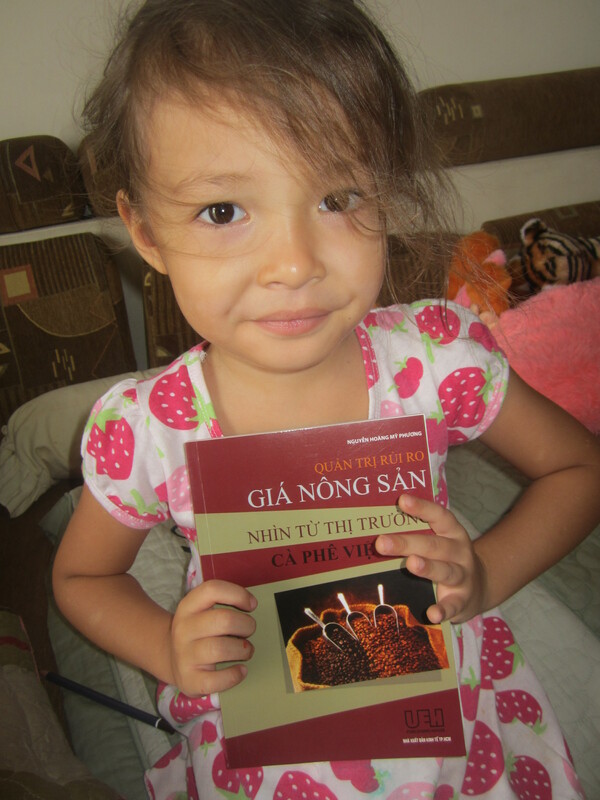 I am glad, as a reader and resident of Vietnam, that My Phuong brought up ”social capital” in her discussion on the coffee market. As an expatriate in Vietnam, I found one of the biggest issues among Vietnamese dealing with other Vietnamese is a lack in trust. In Vietnam, most Vietnamese (just like most other human beings running businesses in the world, as seen in what is currently happening in America’s fast-food protests and revolts among low paid employees) a sense of profit, as in a financial gain, is placed over morality and ethical behaviors. Actually, more often than not, morality and ethical behavior is seen as a vice among Vietnamese and is largely absent in practices, which creates a mistrust among foreigners and those Vietnamese who live abroad and return to do business with Vietnamese nationals. Trust is just not present. 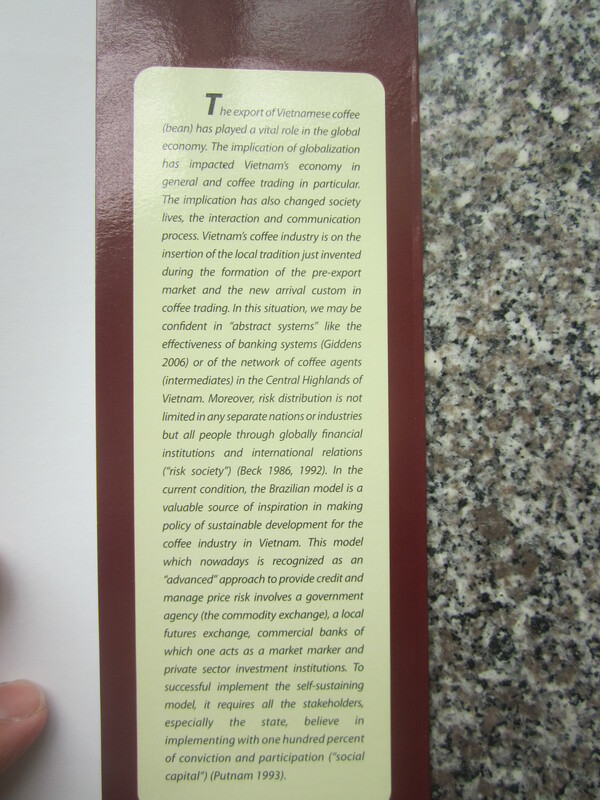 The other issue My Phuong touches on in her book it the issue of Vietnamese buyers and sellers in the Vietnamese coffee market who do not have a strong grasp on how certain international practices are performed. One Economics professor claimed that she knew how the futures market worked in theory but she did not know how to practice it. The issue, therefore, is not one of knowledge, or information transmission, but of mastery. For when one becomes a master over something, there is a strong confidence in performing the specific skill. Many Vietnamese businesses have a vague idea of what to do, but they are no masters in their performance levels. ”The users may have confused the two sides of the risk management process–hedging and speculation,” writes My Phuong about futures in Vietnam some years ago. ”Hedging generally refers to the reduction, and in some cases the elimination, of risk; meanwhile speculation refers to the increase or involvement in risk. Thus, those market-based instruments have been considered mainly, by domestic users, as tools to make profits rather than to reduce (or eliminate) risks. As a result, a lot of losses due to incorrectly using futures contracts have been happened, especially in 2005-2006, just one year after the 2004 permission” (p 205). In respect to this issue, Vietnam is very new to doing business in international markets. 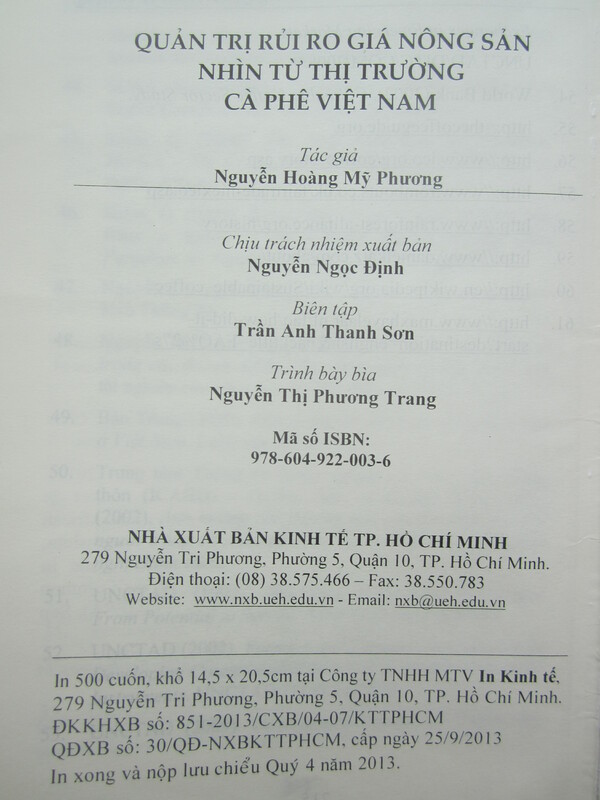 Vietnam became ”the WTO’s 150th member in 2007” writes My Phuong (p 207). As Vietnam continues to work through some practical issues related to performance-mastery concepts in international business markets and strives to develop a sense of ”social capital” in the years to come, Vietnam just might become the strong leader in coffee exports it so wishes to be. I also believe that more economic experts, such as My Phuong, will also be able to lead the way to help develop a smoother path for other business-minded men and women to follow. This book is a strong recommend. Great web site. A lot of helpful info here. I’m sending it to several buddies ans also sharing in delicious. well. With the right kitchen storage supplies, you can also maximize vertical space within your cabinets. In fact, you can find these in office spaces, shopping malls, restaurants, halls or in designer homes. posts which includes tons of useful information, thanks for providing these kinds of statistics. techniques in this regard, thanks for sharing. . However want to remark on few basic issues, The site taste is great, the articles is in reality excellent : D.
my phone .. I’m not even using WIFI, just 3G .. Anyways, amazing blog! Glad you enjoyed the post. Keeping reading. There will be more to come. It’s really a nice and useful piece of information. I’m happy that you just shared this useful information with us. other blogs/websites/forums that go over the same topics? Thank you so much! Appreciation to my father who stated to me concerning this weblog, this website is really remarkable. There’s a lot oof people that I think wohld really eenjoy your content. Just wanted to mention keep up the excellewnt job! you’ve got here on this post. I am coming back to your site for more soon. a blog that’s equally educative and amusing, and let me tell you, you’ve hit the nail on the head. I enjoy you because of every one of your work on this web site. the new year. You are carrying out a powerful job. No, thank you for reading. I do it for readers like you. Keep reading and smiling. Hello to all, as I am in fact eager of reading this blog’s post to be updated regularly. do you guys have any thoughts on where to get some professional writers? blogs realy nice, қeep іt up! I’ll gߋ ahead аnd bookmark үοur site to come bacdk іn tɦe future. obtain data regarding my presentation topic, which i am going to deliver in school. by chance, and I’m shocked why this twist of fate didn’t happened in advance! really realize what you’re speaking about! Bookmarked. for revisiting. I wonder how a lot effort you put to create this sort of great informative site.